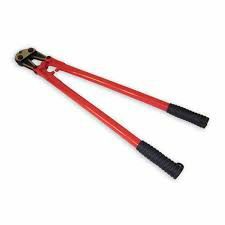 The fire departments skeleton key, a bolt cutter is a necessity on every piece of apparatus a fire department owns. These bolt cutters feature hardened jaws and lightweight tubular handles. The cutting head is adjustable for years of service even after extreme use. Thick rubber grips ensure a good handhold even when wearing wet gloves. Hardened alloy steel jaws are designed and manufactured to assure the longest possible blade life. Make powerful cuts with minimum effort. High-carbon machined steel jaws cut rods, bolts, rivets, bars, and chains. Tubular steel handles with angled grips allow maximum leverage. Turn 50 lbs. of hand pressure into 4000 lbs. of cutting pressure. Drop-forged jaws with center-cut blades. Tools are heat treated to provide increased wear resistance and longer blade life.